Alita: Battle Angel went to great lengths to get some aspects of Yukito Kishiro’s manga series correct on the big screen, including the way Rosa Salazar’s eyes were enhanced for the flick. 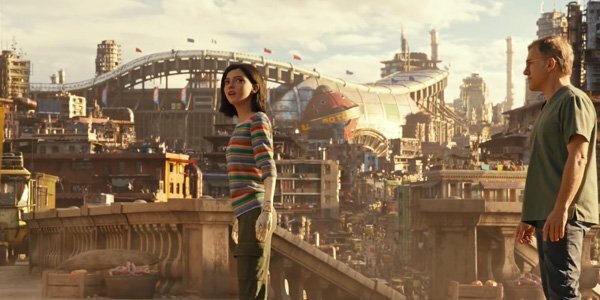 However, other details were changed, including the setting of the story, and as it turns out there’s a reason Alita: Battle Angel got switched from Kansas City, Missouri to Panama City, Panama. Per Robert Rodriguez, it was James Cameron who figured out that Zalem and the Iron City would be better off set in a warm location near the equator rather than in a temperate one. Then Rodriguez decided Panama City would be the best place to build the 23rd century world, set several hundred years after a great war left the Earth in ruination. With Avatar and even Titanic, James Cameron has had an avid interest in the scientific components of those properties. (Although he notably may have gotten the Titanic sinking wrong.) So, it’s not shocking to me that if he was working on a movie with a space elevator that he would have wanted to make sure the details were at least somewhat feasible. In addition, although the story is based on a manga novel written in Japan, Robert Rodriguez also revealed to Complex that Jim’s vision was always “more of a melting pot,” meaning setting the story in a specific place wasn’t that important to the final vision of the film. It took a long time for Alita: Battle Angel to come together. Robert Rodriguez previously revealed that James Cameron had approached him with the idea a long time ago, specifically back when he was working on Sin City, which was released back in 2005. That’s a long time for a project like this to gestate, but it also assumedly means that people like James Cameron and Robert Rodriguez had plenty of time to think about details like space elevators and temperature. If you haven’t caught it yet, Alita: Battle Angel is still in theaters now. We’ll of course let you know if the flick does end up getting a sequel. For now, take a look at what else is coming up with our full movies schedule. Erica Dixon: Rotimi From “Power” is NOT the Father of My Twin Babies Dementia warning: The dizzy symptom you may be ignoring - are you at risk?